The card design is simple and doesn't try to do too much, which suits the product perfectly. Prior to opening the product, I was expecting the cards to be made of thin stock and feel cheap, but those expectations were unfounded as the stock is fairly thick and features a decent coat of UV gloss. The only real weakness of the RRBS's card design comes way of the sticker drop autographs. I wonder when card company's are finally going to realize how bad a sticker drop looks on glossy cards, they should have two different types of stickers, one for use with glossy cards and another for use with non-glossy cards. Although the sticker drops used in RRBS bother me far less than most products due to the cheap price point. The all rookie checklist is fantastic and offers collectors a deep look at the 2010 rookie class. Although Dan LeFevour's cards are worthless in my eyes, it was refreshing to see him in a Bengals uniform rather than a Bears uniform. LeFevour was cut by the Bears in the preseason and I might be mistaken, but this is the first product to feature him on the correct team. The set includes big names like Tebow, Bradford, Suh, Bryant and Mathews, but perhaps the most impressive part of the product is amount of lesser known rookies that grace RRBS's checklist. The only glaring omission is LeGarrette Blount, which at this point borders on heresee seeing as how he rushed for 1,000 and had the best season of any rookie running back. It would be great if extended the checklist to 150-250 next year, how cool would it be if there was a product that had every single 2010 rookie!? You really can't go wrong paying $20 for 100 Rated Rookies and 1 guaranteed Rated Rookie auto. However, I do feel it necessary to point out that it borders on impossible to pull a Bradford, Tebow and many of the top tier rookie autographs, but there's plenty of interesting autographs that are fairly easy to pull such as Joe Webb, which was more than fine with me. One of the most enjoyable things about the Rated Rookie Box Set is that there is essentially a 0% chance of ending up with a bad case of buyer's remorse, which is the single greatest problem in cards. 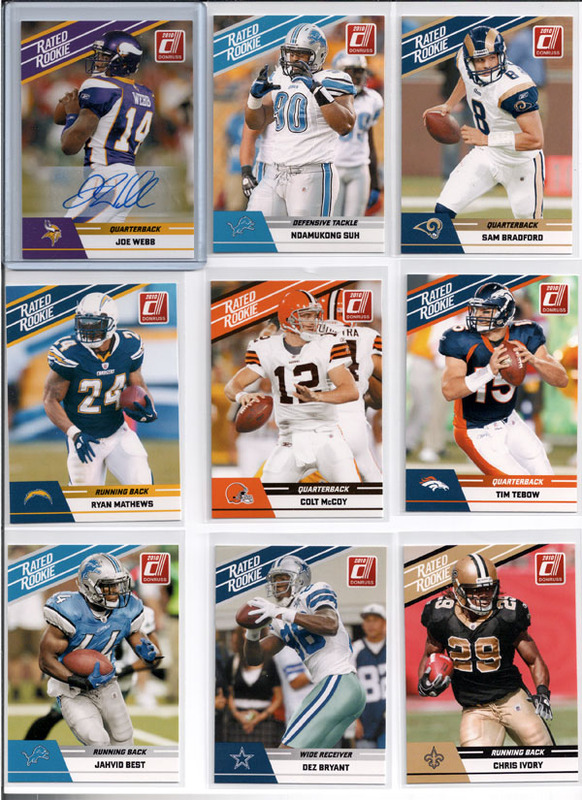 For collectors looking for some quick football card fun, the RRBS is just the box for you. I think kids would especially enjoy this set. The 2010 Donruss Rated Rookie Box Set is essentially a blaster box on steroids. The 100 card box set delivers plenty of big name rookies like Bradford, Tebow and Bryant in addition to a refreshing amount of lesser known rookies. If you're a collector on a budget or simply looking for some quick football card fun, I highly recommend you consider grabbing one of Panini's Rated Rookie Box Sets. Each $20 box set delivers a 100 card Rated Rookie Set in addition to 1 guaranteed Rated Rookie Auto. Solid blurb and I agree… Webb is a decent grab given the fact that the product boasts some 100 rook’ autos. Boxed sets are one of my favorite things to put away unopened for the long-term, so I purchased two of these sets (one to open, and one to put away) and was looking into buying a case of them to hold for a while. I was shocked when I opened my set to get a redemption for my autograph, not only that but it expires in just 18 months. I wish Panini would publicize the amount of redemptions in these sets so that we would have an idea how much long term value the sets will have. Brad- the redemption card issue is my biggest disappointment with this, otherwise, very nice set. I purchased 6 sets, and got 4 redemptions. The only auto/redemption that I pulled that has anything more than minimal value on the secondary market was a Tony Moeaki redemption card. The secondary market thing isn’t that big a deal to me, but, getting redemption cards for guys that are fairly obscure makes redeeming them seem a little less than urgent…takes some of the fun out of it for me…I hate redemption cards. I busted case of these Feb 2014. Do not buy them for the autographs. Only buy them for any rookies you need from the base set. Of 20 boxes in a case, half were expired redemptions, 4 were of the same player and of the other six, only Dennis Pita was familiar to me.